Where to Swim at Byron Bay? A locals guide. Where to swim at Byron Bay? Charming spots favoured by locals. It takes time to get to know a new place and in some places, even longer to break through the ‘Local’s Only’ knowledge barrier. Any traveller on a road trip can tell you about the times they’ve learned about a fabulous “unmissable” spot, long after they’d left town. Google is a fabulous friend, and Google Maps our co-driver, but nothing beats having a real-life local to show you around. Grab a pen or take a screenshot. You’ll want to remember where to swim at Byron Bay when you next visit. Here’s the stuff we tell our friends! You can’t go wrong swimming along the beachfront anywhere from Main Beach (in front of the Byron Bay Surf Club) heading right to Clarkes Beach, and all the way along the beachfront up to the Pass. With clean white sand, turquoise water, and (mostly) gentle waves, swimming anywhere along this stretch rates highly for locals and tourists alike. North facing, the gentle curve of this beach offers some protection against the wind. Main Beach has a surf-safety patrol on guard all year round. The Pass is a favourite – shallow for the kids, yet perfect for surfers of all ages too, so grab a board and join in. Wategos Beach is a dolphin and whale-spotting haven, and one of our favourite spots to hang out year round. Soak up the millionaire vibe sitting in front of decadent beach houses and designer homes perched in the hills above while drinking a cup of your favourite coffee-on-the-go. There’s free BBQ’s to use and picnic tables under the shade of trees, but be up early for the best spot and a car park. This is a family friendly beach. Access is via Lighthouse Road, with a left turn into Brooke Drive. I lived here for years before I knew about this little secret spot. The only way to get here to this tiniest stretch of magical sand is to walk the wooden pathway from Wategos Beach, starting at the end of Marine Parade. This track takes you to the Lighthouse. Just turn left at the fork in the road and head down to the water. It’s enchanting and a favourite haunt of those who like to fish from the rocks. Bring your camera to capture action shots. Not exactly a swimming location but still a must do! If you have access to a 4WD or don’t mind taking your sedan off-road, then Minyon Falls, about an hour west of Byron Bay, is also on our list. Take your walking shoes and make the effort to hike up to the viewing platform. 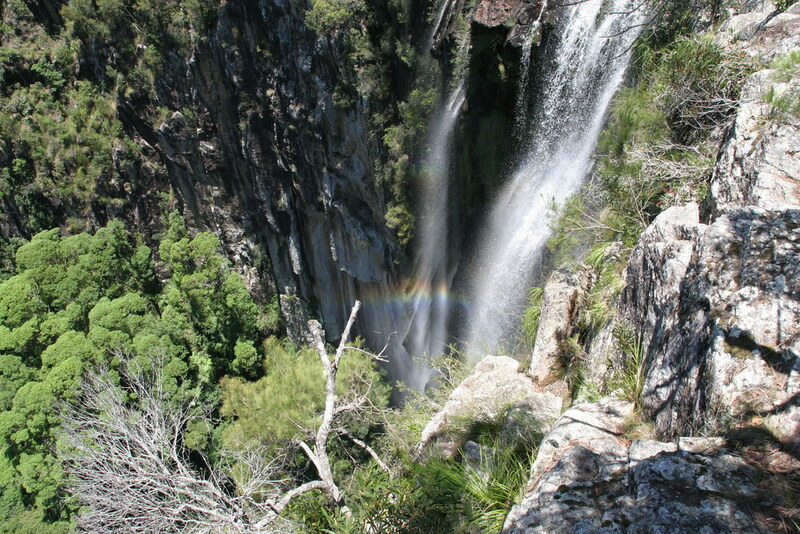 Then walk the four-kilometre trek to the base of the falls to experience the falls from the other side. Look up – the water falls from 100 metres high! Our tip: go after rain to see the falls at their finest. You can’t swim in Minyon Falls due to the endangered species who call the waterhole home, but its still a beautiful and refreshing sight. And our favourite thing to do after a long day in the sun at the beach? A shining chrome manicure to match the shimmering waters. Where to swim in Byron Bay? Tell us your favourite! Pingback: Our 3 favourite Byron Bay Waterfalls, perfect for weekend adventures!